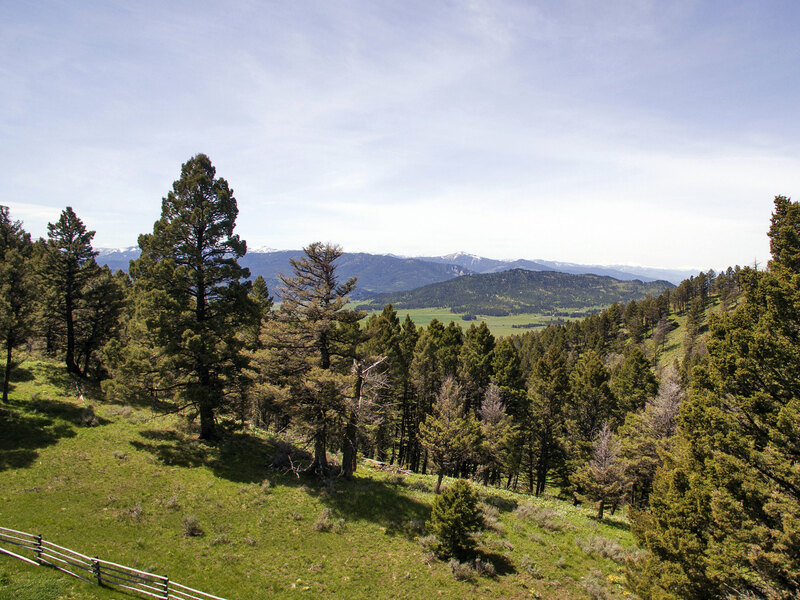 Bridger Hollow Ranch consists of 285± deeded acres of alpine mountain meadows and mature pine and fir trees located in the famed Bridger Mountain Range. 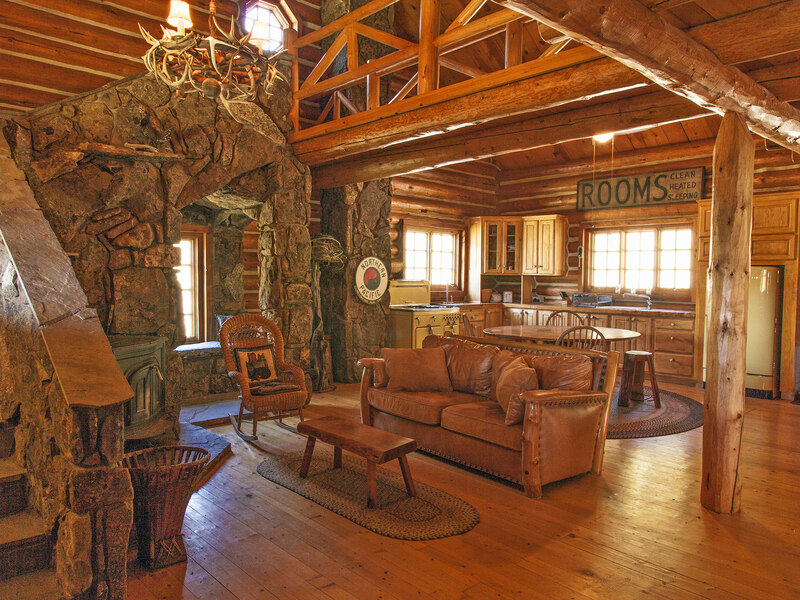 The Ranch possesses dramatic mountain vistas, tremendous privacy and comfortable rustic improvements. The compelling and vibrant communities of Bozeman and Livingston are both a comfortable 25 minute drive from the Ranch. The proximity of the Ranch to outdoor recreation, cultural amenities, Yellowstone National Park, a commercial airport, private FBOs and Bridger Bowl Ski Resort make Bridger Hollow Ranch an all-season recreation retreat. The varied ecosystem of dense alpine timber, grassy meadows and lush riparian areas offer diverse habitat for an abundance of Rocky Mountain wildlife including elk, mule deer, whitetail deer, bear, mountain lion, moose and a wide variety of birds. The 285 diverse acres of the Bridger Hollow Ranch provide reliable and private big game hunting, with several trophy bull elk taken off the Ranch annually. The improvements include a beautiful rustic log home and a classic barn made from recycled lumber that was a former cavalry outpost in the Gallatin Valley. The barn, with power and year-round water, is complete with a set of corrals that are well situated for equestrian enthusiasts. 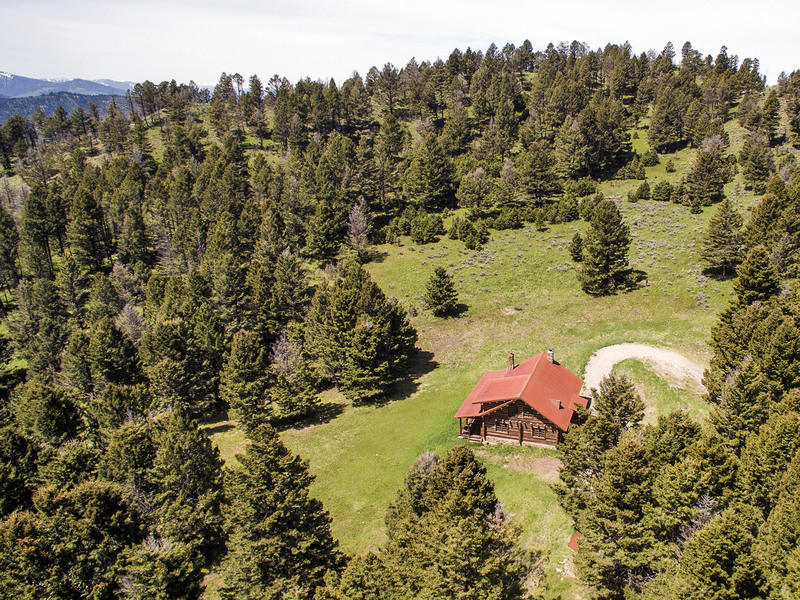 The entirety of the Ranch is protected with a Montana Land Reliance conservation easement that limits additional buildings to agricultural improvements, but allows for substantial expansion of the rustic log home. Bridger Hollow Ranch is located off Jackson Creek Road on Bridger Hollow Road and is a short 25 minute drive from the popular Montana cities of Bozeman and Livingston. The Bozeman Yellowstone International Airport at Gallatin Field is less than 30 miles away and the locally famous Bridger Bowl Ski Area is only a 15 mile drive. Driving from Bozeman to the Ranch, take Montana Highway 86, also known as Bridger Canyon Road, north into Bridger Canyon. Turn right onto Jackson Creek Road and head east until making a left onto Bridger Hollow Road. From Livingston take Interstate 90 West and then exit onto Jackson Creek Road and follow for several miles until you turn right onto Bridger Hollow Road. Bozeman, Montana is a vibrant and active university-oriented city steeped in culture and art. The fourth largest city in the state, Bozeman is home to Montana State University, the Museum of the Rockies and abundant opportunities for fine dining, entertainment venues and shopping opportunities. Yellowstone National Park is easily accessible via either the North entrance in Gardiner, or the West entrance in West Yellowstone. Bozeman is proud to maintain its vibrant downtown core that lends itself to the small-town feeling that couples nicely with an excellent complement of amenities typically found in larger cities. Recently upgraded, Bozeman Yellowstone International Airport at Gallatin Field in Belgrade offers several full service FBOs and excellent commercial services through Alaska, Allegiant, American, Delta, Frontier and United Airlines. The seventh busiest passenger airport in the Pacific Northwest, Bozeman offers direct flights to 14 major airports around the nation including Salt Lake City, Denver, Seattle and Minneapolis. The elevation of the Ranch ranges from 6,050 to 6,890 feet above sea level. The average annual precipitation is approximately 19 inches and the average growing season of the area is 96 to 112 days. Naturally these numbers will vary annually. The surrounding mountains, diverse terrain and elevation allow the weather to change rapidly. Snow has been monitored in every month of the year. Summer average minimum temperatures range from 46° to 52°. Winter average minimum temperatures are typically between 14° and 18°. There is plenty of sunshine with an average of 187 sunny days throughout the year. 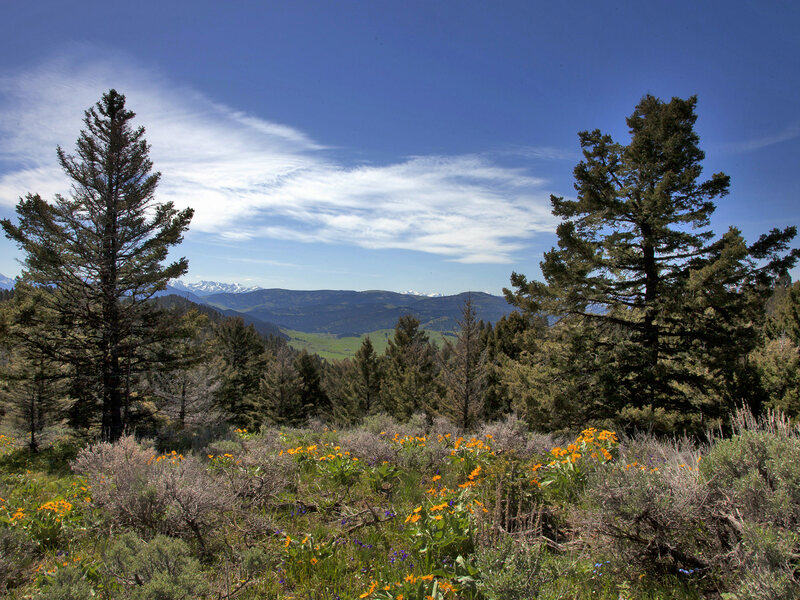 The topography of the 285 acre Bridger Hollow Ranch can be described as a classic Rocky Mountain setting with wildflower-filled alpine meadows and a diverse selection of mature fir and pine trees. The rustic cabin is nestled in a bowl in the center of the Ranch, creating a very private setting that feels a world apart, while maintaining great proximity to amenities. The Ranch has been used exclusively as a recreational retreat for the owners, their family and friends. They have not pursued grazing cattle, but there would certainly be interest from local ranchers to lease the seasonal grazing rights, which would generate a modest annual income. The typical grazing season in the area runs from June until the end of October each year. Depending on the moisture levels of the preceding winter and the timing of spring snow melt these numbers can adjust seasonally, however the snowpack and precipitation levels in Bridger Canyon have been historically consistent. The real estate taxes for 2014 were approximately $1,900. The Seller will convey the Ranch without reservation of whatever mineral, oil, gas, geo-thermal, hydro-carbon and gravel rights which they actually own, subject to reservations by previous owners. The Seller makes no representation as to the quantity or quality of any mineral or other subsurface rights appurtenant to the Ranch. All water rights appurtenant to the Ranch will convey. There are no irrigation water rights, but there are stock rights and a water right associated with the domestic well. 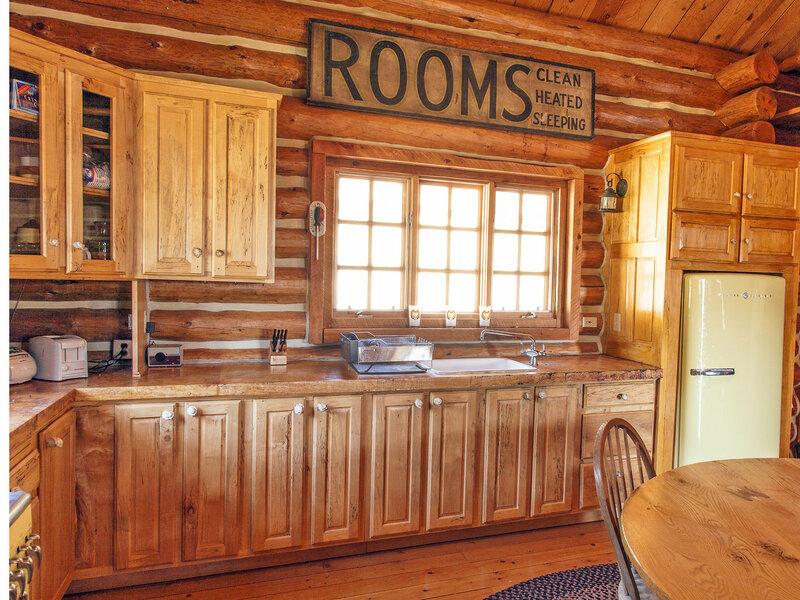 Electricity to the rustic log cabin and equestrian barn is provided by Northwest Energy. The owners have always utilized the Ranch as a retreat to relax from the rigors of a technology-driven lifestyle, so there is not a land-line telephone, but the area does offer limited cell phone coverage, satellite television and satellite internet. Domestic water for the home and barn is provided by an individual well located near the barn, and runs via an underground pipeline to the cabin. The propane tanks serving the home and barn are owned and the current propane provider is Northern Energy Alliance. All of the improvements on this Montana Ranch for sale, including interior and perimeter fencing, are well maintained. They appear to be functional and reflect no large future deferred maintenance expenses. 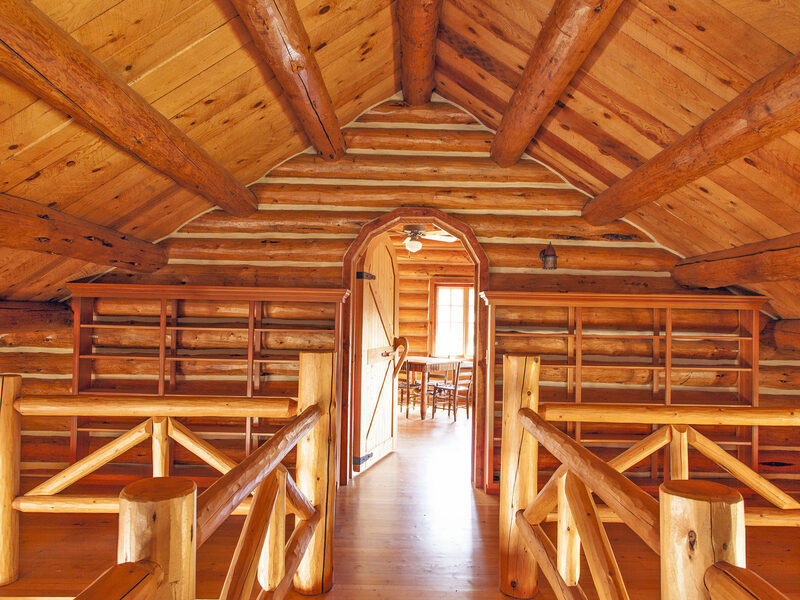 The custom log home, built by renowned-builder Alpine Log Homes, is located on a ridge line in a very private upper meadow. 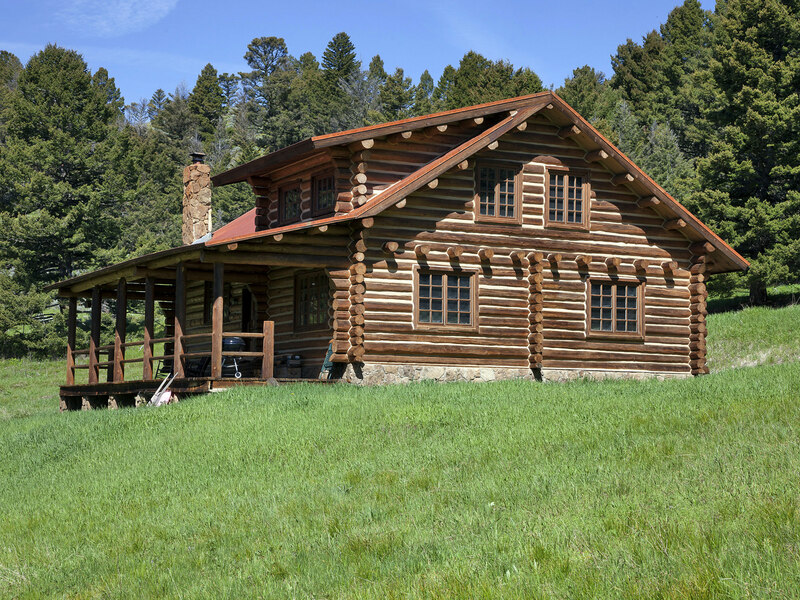 The dove-tailed log home features a newer metal roof and consists of approximately 1,700 square feet of living space. The home has two main level bedrooms and a spacious sleeping loft on the upper level. There is a handsome and welcoming natural mossy-stone fireplace in the open great room. The dining area, kitchen and a full bathroom complete the main level. The covered deck facing west to the Bridger Mountains beckons for a rocking chair and celebratory beverage while recounting the adventures of the day. 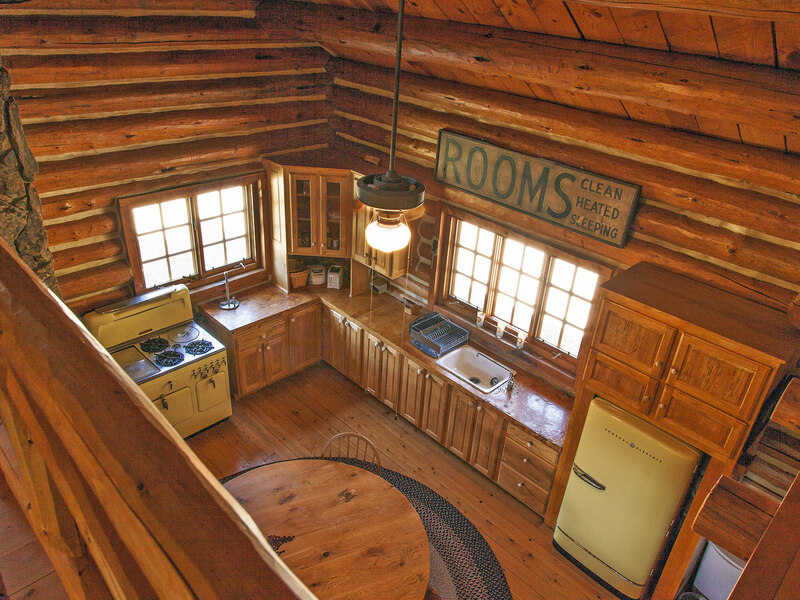 The functional kitchen contains all of the modern amenities and appliances that support the aesthetics you would expect to find in a rustic Montana log cabin. The home is efficiently heated with a wood-burning stove and supplemented with electric registers. It is on a private well and septic system. Built in the late 1980s, the house has been well maintained over the years and appears to be in very good repair. There is a classic barn made from recycled lumber that was a former cavalry outpost in the Gallatin Valley. The original structure was disassembled and then rebuilt on Bridger Hollow Ranch, creating a compelling combination of historic materials and modern construction. The barn, with power, year-round water and a set of corrals, is well suited for equestrian enthusiasts. 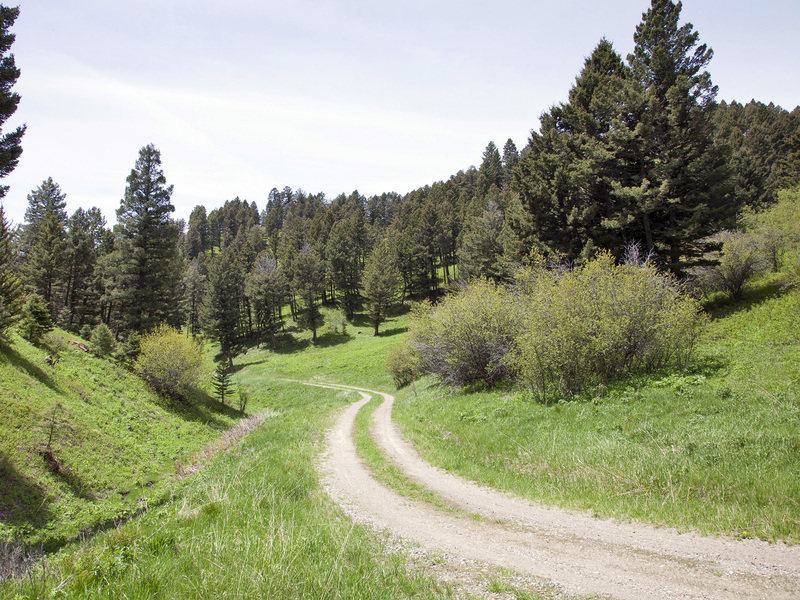 Bridger Hollow Ranch is currently in a conservation easement held by the Montana Land Reliance. This MLR easement limits additional building on the Ranch to agricultural structures and the current log home has been approved for an expansion up to 4,000 total square feet. Details and copies of the MLR conservation easement are available from the Bozeman office of Swan Land Company. Bridger Canyon has been at the forefront of planning and zoning in Montana for many decades. The Bridger Canyon zoning district is focused on the preservation of open space and agricultural-land uses and provides for one residential building, with associated outbuildings and improvements, per forty acres. It is the intent of this regulation to preserve agriculture as one of the primary occupational pursuits and an economic endeavor in Bridger Canyon. It is further the intent of this District to protect and preserve the existing rural character of Bridger Canyon and to preserve existing developed and undeveloped farm lands from unplanned residential, commercial and industrial development. Bordered by a section of State ground and neighboring large tracts of the Gallatin National Forest, Bridger Hollow Ranch is situated in the shadows of the Bridger Mountain Range. “The Bridgers” provide excellent opportunities for mountain recreation – hiking, horseback riding, mountain biking, fishing and camping just to name a few. Trout fishing in southwest Montana is legendary and anglers come from all over the nation and world to experience the fly fishing available in southwestern Montana and Yellowstone National Park. The list of famous rivers within an easy day trip from the Ranch read like a destination-fishing guide book with the Yellowstone, Gallatin, Madison, and the spring creeks of Paradise Valley all within less than an hour. Expanding the scope just a little includes additional notable rivers like the Jefferson, Big Hole, Ruby, Beaverhead and Missouri. The Ranch would be an outstanding home base, providing the devoted angler miles of rivers and streams to relish for a lifetime on a comfortable “day-trip” basis. An indication of this area’s world-renowned trout fishing reputation is the headquartering of the internationally-acclaimed Simms Fishing Products in Bozeman and Winston Fly Rods in Twin Bridges. The Ranch attracts a wide selection of wildlife. The owners have historically allowed friends to hunt on the Ranch and they have taken numerous trophy elk over the years. There are also whitetail and mule deer, moose, bobcats, mountain lions and mountain blue grouse. Exceptional alpine skiing is just minutes from the Ranch at Bridger Bowl which offers ‘Cold Smoke’ snow on over 2,000 skiable acres and a 2,700-foot vertical rise. Bridger Bowl offers a wide variety of terrain including long slopes, glades, chutes and gullies. Just north of Bridger Bowl, Bohart Ranch offers 30 kilometers of groomed Nordic-skiing trails. Situated on private and Forest Service lands, the scenic trail system covers terrain well suited to all levels of ability. Big Sky Resort and Lone Mountain Ranch are less than 70 miles away and offer world renowned alpine and Nordic skiing. Ranked as one of the Top 10 ski towns by Skiing Magazine, Bozeman offers a comfortable, small-town feeling with big-city amenities. The next owner of the Ranch will live in a number of different worlds with fishing, hunting, rafting, skiing, and the cultural amenities of Bozeman so easily accessible. A full slate of NCAA Division I Intercollegiate athletics events is available at Montana State University and there are many avid fans that actively follow the Bobcat teams. 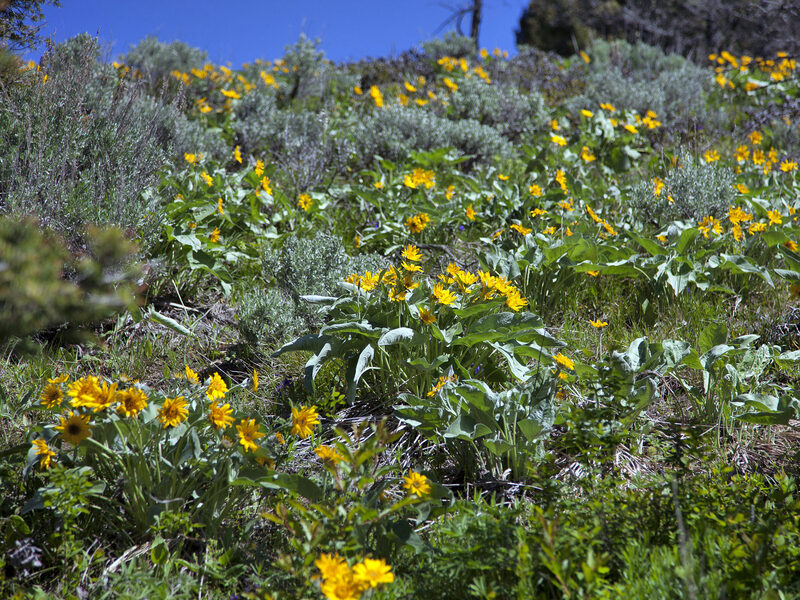 Long before Lewis and Clark arrived in the area, the Native Americans referred to the Gallatin Valley as “The Valley of Flowers”. Although the Valley was claimed by the Blackfoot, it is said that it was recognized by all Indians as neutral ground. Bridger Canyon was settled in the late 1800’s by farmers and loggers prior to Montana gaining statehood in 1889. Skiing began in the area as early as 1916 when a group of men of Scandinavian descent met Sunday mornings to ski the Story Hills area. By the late-1930s a small tow rope was built to accommodate the skiers on this hill. The Bear Canyon ski area was also being constructed during this era. By 1948, due to scarce snow conditions at both locations, a search began for a site with sufficient snow. Viewed during an air search, a natural bowl on the east side of the Bridgers was located and by the following year the Montana State ski team began to train on what would soon become known as Bridger Bowl. What started as 120 acres in 1955 has grown to over 2,000 acres of skiable terrain that includes the famed ‘Ridge’ and Cold Smoke powder. Today, people are drawn to Bridger Canyon for the same reasons as the homesteaders over a hundred years ago – the love of the land, fertile ground, the solitude yet close proximity to Bozeman as well as the unparalleled surrounding beauty. Bridger Hollow Ranch offers the opportunity to acquire a very private and beautiful alpine escape with great elk hunting and close proximity to the very desirable Montana cities of Bozeman and Livingston. 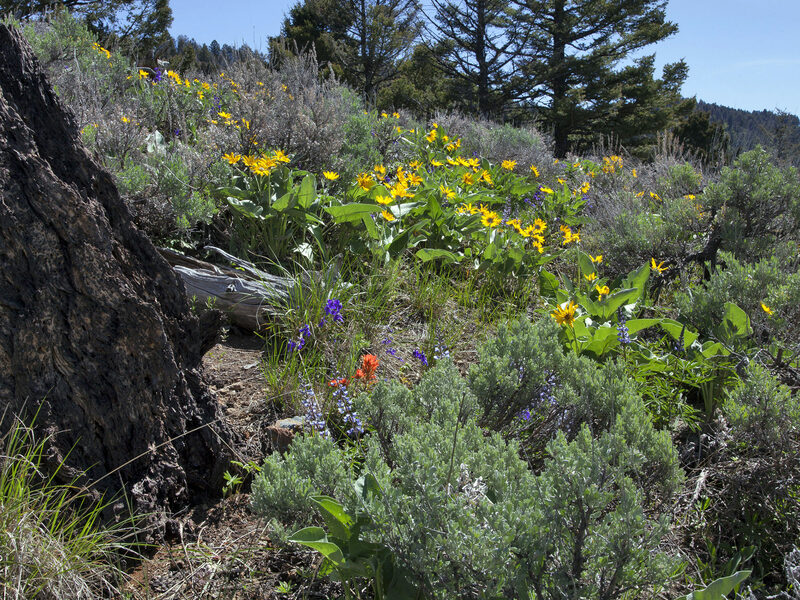 Bridger Hollow Ranch is modestly improved by the standards of many opportunities in Bridger Canyon and Jackson Creek. This allows the new owner the opportunity to remodel the home, without the burden of inheriting improvements that are not well suited for their needs. 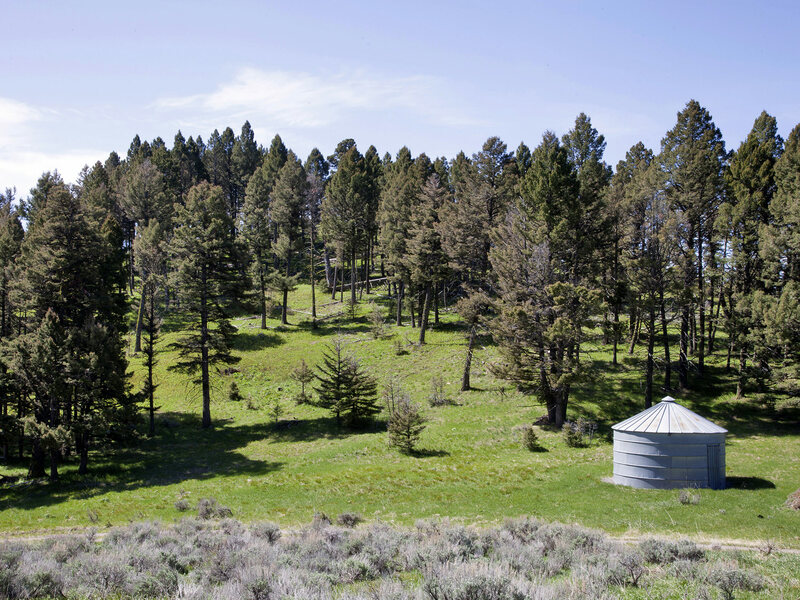 Bridger Hollow represents one of the largest parcels on the market in the Bridger Canyon and is a special opportunity to combine privacy without being remote.